Down's Syndrome is a genetic condition in which a child is born with 47 chromosomes instead of the usual 46. The extra chromosome almost always appears as an additional chromosome 21. An extra chromosome 21 is known as "Trisomy 21," which means "third" chromosome (one from the mother plus one from the father plus the additional one makes three). Trisomy 21 is responsible for 92 percent of all Down's syndrome cases. Down's syndrome is normally very recognisable due to the characteristic appearance of those with the condition. The presence of an extra 21st chromosome interferes with normal body and brain development. In addition to altered physical features, children with Down's syndrome experience slower than normal physical development. In most cases, they never reach full adult height. Down's syndrome children also face delayed mental and social development. Mild to moderate mental impairment is always present. Down's syndrome occurs in one out of 700 to 800 births. It is a possible outcome for all races and economic groups. 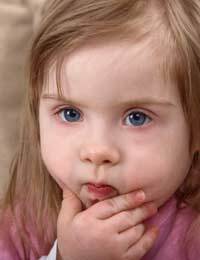 The initial diagnosis of Down's syndrome can usually be made at birth based on the appearance of the child. A blood test can confirm the diagnosis. If Down's syndrome is expected before delivery, tests are available (like amniocentesis) that will indicate the condition before the baby is born. There is no specific treatment for Down's syndrome and it is a life-long condition. Some related conditions may require early intervention in the form of surgery. Children with Down's syndrome will require special education, alternate training methods and speech therapy in order to reach their full academic potential. Individuals with Down's syndrome are living longer than ever before today. As a result, other related conditions have been seen. For example, Down's syndrome sufferers have a much higher risk of experiencing heart problems and leukaemia. Parents who have a child with Down's syndrome face the dilemma of deciding which type of school should be attended. Given the obvious visibility of the syndrome, many opt for special schools created specifically for Down's syndrome children. However, in recent years, inclusion in mainstream schools has been the more common choice. Inclusion in mainstream school is an important first step toward later inclusion in the community. The best advice for families that include a child with Down's syndrome is threefold. First, it is vital to assemble a team of professionals that will provide excellent health care, physical therapy and appropriate educational interventions. Second, families should seek out other families and support groups. It is often difficult to realise how isolated we are until we are able to access others who truly understand our situation. Finally, it is imperative that families not believe the myths related to Down's syndrome. When working with children who have Down's syndrome, it is often easy to see the disability before seeing the individual. However, if we see the child first and then deal with the disability, then there is every possibility that children with Down's syndrome can achieve at a high level.